The Office of Alumni Relations is seeking nominations for the George Arents Award, Melvin A. Eggers Senior Alumni Award and the Generation Orange Award. These distinguished alumni awards will be conferred during Orange Central Weekend, Oct. 9-12. Nominations for Orange Central 2014 will be accepted until March 14, and nominations may be submitted online at http://www.syr.edu/alumni/awards/nominationform.html#449:1086:_P7bH8JfyEeOrLOP-BPDQzQ. More information can be found on the awards site at http://www.syr.edu/alumni/awards/. 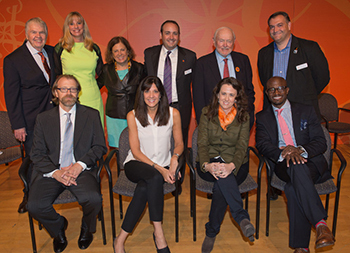 Arents Award recipients for 2013 and the Syracuse University Alumni Association (SUAA) Awards Committee pose together. They are: Front row, left to right: George Saunders G’88 (2013 Arents recipient), Carolyn Lindheim ’84, Tracy Barash ’89, Taye Diggs ’93 (2013 Arents recipient). Back row, left to right: Henry Grethel ’54 (2013 Arents recipient), Laurie Taishoff ’84 (president, SUAA), Carole Eisner ’58 (2013 Arents recipient), Andrew Laver ’01, Sid Lerner ’53 (2013 Arents recipient) and Mark Verone ’95. The George Arents Award is Syracuse University’s highest alumni honor, presented annually to alumni who have made outstanding contributions to their chosen fields. The award is named for George Arents, a successful manufacturer who served on SU’s Board of Trustees from 1930 until his death in 1960. Among his many legacies to the University is a fund he endowed in 1939 to establish the George Arents Award, an annual honor recognizing SU alumni for their extraordinary achievements. The Melvin A. Eggers Senior Alumni Award is presented to those alumni who have graduated more than 50 years ago and have demonstrated loyalty and service to Syracuse University. This award is conferred at the Melvin A. Eggers Senior Alumni Dinner during Orange Central. Introduced in fall 2013, the Generation Orange Award recognizes young alumni who have made an impact on campus and in their communities through their volunteer work and philanthropy on behalf of SU. The award is conferred at the signature Generation Orange event during Orange Central. Recipients of this award must be part of Generation Orange, meaning they are 35 years old or younger and have graduated within the last 10 years; may not be SU staff members; and must be available to accept the award on campus. For more information regarding these awards, contact the Office of Alumni Relations at 800-SUALUMS (782-5867) or sualumni@syr.edu.